You may hear toner-based printer companies boasting a certain speed for envelope printing, but fastest possible speed and real-world speed can be quite different. The fastest possible speed is figured under perfect circumstances where every single variable is the best it can be. For many customers, though, that’s an unrealistic setting. 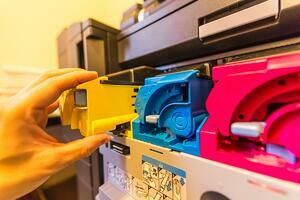 Inkjet printing does have faster speeds than toner-based devices. It’s because of how quickly the envelopes can be run, and it’s also because inkjet printers reduce downtime between jobs and require less hands-on attention overall. In equal circumstances, inkjet is faster. Inkjet printing prints envelopes with full bleed, meaning you can have rich, colorful imagery that goes beyond the very edge of the material. Toner printers just don’t do that. The envelopes toner printers put out – even toner printers specifically geared toward printing envelopes – don’t stack up appearance-wise. Inkjet printing gives a better result. With the iJetColor envelope press, there are two types of consumables: ink and the printhead. With toner printers, you have more consumables (toner, image drums, belts, fusers, etc.) and a higher replacement cost for those consumables. This drives your real-world cost per piece much higher when using a toner-based printer for envelope printing. When all is said and done, there’s really no doubt that toner-based printing is slower and more expensive than inkjet printing. For higher speeds, better quality, and fewer expenses, look to inkjet printing.